If you've been searching for a fun and affordable car, the 2017 Nissan Versa and the 2017 Nissan Versa Note are perfect choices. Coming in both sedan and hatchback body styles, the Versa and Versa Note offer a great deal of exciting amenities that drivers will love. This model year, the Versa sedan is getting a new SV Special Edition package, while drivers will find a few styling changes on the Versa Note. Continue reading our full 2017 Nissan Versa review below for more information! 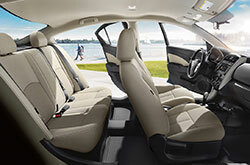 The 2017 Nissan Versa sedan, available now in Mesquite, comes with a variety of excellent standard amenities like a four-speaker sound system, an auxiliary audio input jack, Bluetooth connectivity and steering-wheel audio controls. Higher trims on the sedan include more luxury and tech features like a rear spoiler and cruise control (S Plus); upgraded upholstery, remote keyless entry and upgraded instrumentation (SV); and satellite radio, alloy wheels and navigation (SL). The 2017 Versa Note hatchback comes similarly equipped, but adds features like a 5.8-inch touchscreen, a sport steering wheel and an adjustable cargo floor, depending on the model you choose. A 1.6-liter four-cylinder engine that produces 109 horsepower and 107 lb.-ft. of torque is the standard powertrain on the 2017 Nissan Versa near Dallas. A five-speed manual gearbox is standard on the base Versa sedan, while the Versa Note and all other sedan trims come with a continuously variable transmission (CVT). Boasting a nimble driving feel and terrific fuel economy, the Versa is ideal for those looking for "a good grocery-getter and an easy parker," according to Edmunds. 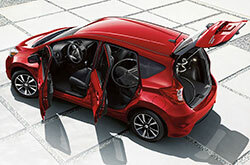 On top of its excellent features list, many 2017 Nissan Versa Note reviews have praised the car for its list of standard safety amenities like side curtain airbags, traction and stability control, antilock brakes and front-seat side airbags. More advanced features include a 360-degree parking camera that family car shoppers will love. 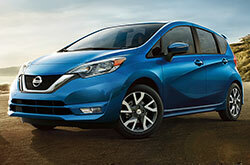 Stop by Trophy Nissan today to take the Versa or the Versa Note for a test drive! If you've been on the hunt for new car models near Dallas like the 2017 Hyundai Accent, Toyota Yaris iA, Honda Fit and the Ford Fiesta, then you should not overlook the opportunity to view the 2017 Nissan Versa. 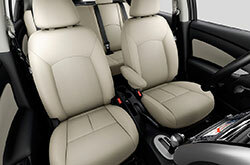 Offering a fun-loving persona and state-of-the-art cabin features, it could be just what you need from a vehicle. Once you've obtained the information you want for the 2017 Nissan Versa, browse our website to find information about current financing incentives from Trophy Nissan. For new and pre-owned cars, choose us to find a superb selection, which includes the highly regarded Nissan Versa. We hope our 2017 Nissan Versa review helps you when you're ready to make your final buying decision. 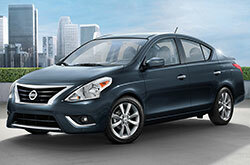 Our selection of excellent Nissan Versa models in Mesquite, TX is huge. Use our online form to schedule a test drive and come peruse our lineup. For those who are anxious to see it instantly, we've embedded a video walk-around that presents its equipment.